First off, let me say it: weight, its not that big of a deal. There is a strong caveat to this, which is that it is a definite advantage, but so is height, or knowing the scoring system, or fighting since you were 10, or having a fight on your home turf, and so many other things. So while weight is always a potential advantage, it is just one among many possible advantages. You can beat people who have the weight advantage over you, just like you can with any of those other advantages. 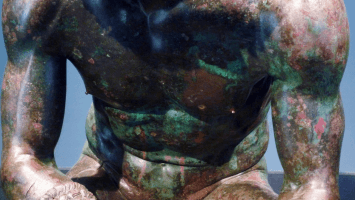 I know that in the West they make a huge deal about weight, encouraging enormous weight cuts and often producing very sluggish fights because of this. I also know that Thais can also make a very big deal about weight, as its very important to gambling odds. But, as a western female fighter in Thailand you can overcome weight disadvantages, just like anything else. 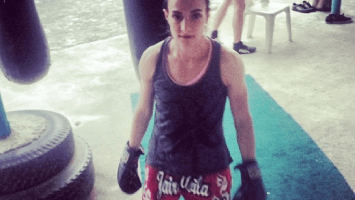 This article is about my own experiences with giving up weight in Thailand with an aim towards a larger view of how this may play out for other western female fighters who may come here to fight as well. 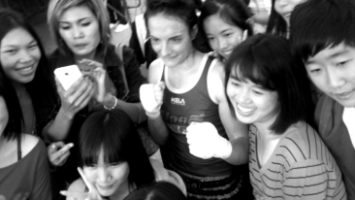 While I’ve been a part of a lot of fights, seen a lot of fights and know quite a few other western female fighters in the country, I am by no means an authority – Thailand is just too varied. This is just an overview from where I’ve been so far. When westerners first come to Thailand they will likely be given the weight advantage upon their initial fights. This is for a number of reasons. 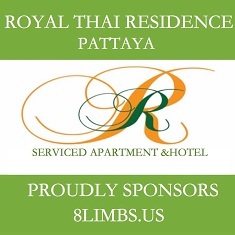 This ranges from the adventure tourism fight wherein your gym is aiming to secure a fairly certain win in order to “sell” the experience and gain a repeat customer from these clients, to a legitimate attempt to even out a matchup due to westerners often having far less experience at the same body weight as our Thai counterparts, to also the possibility that there simply are not many (or any) opponents at the same weight as larger-bodied westerners. 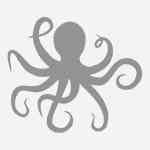 These weight disparities can be moderate at a few kilos, or they can be comical with absolutely huge size discrepancies. This method of giving westerners a weight advantage early on didn’t really happen for me because I’m so small, but it is very common. On the other hand fighting over your weight is something that many western female fighters will experience here the longer they are here, if they are not at the much larger end of the spectrum, as they show they can handle the size mismatch. A number of western women I know who have fought in Thailand long-term (or in the case of Vicky Carey over many years but coming and going out of Thailand) have fought up in weight somewhat regularly. Some of this is due to a relative scarcity of opponents at the lower end of the weight class scale, which Emma Thomas, Vicky, Teresa Wintermyr, Sylvie Charbonneau and I have all experienced (the list is not exhaustive, a few that I know). It starts slowly. At first we are given slightly larger opponents and if we do well in those fights then it can become a pattern which can just get momentum, leading to bigger and bigger disparities. 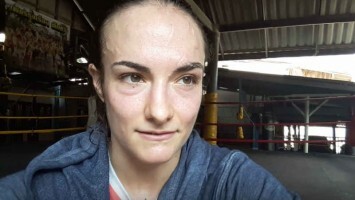 (I did leave my first gym in Thailand because it was getting a little out of control when I seemed to be just thrown to a 60 kg opponent, and I know of at least one other top fighter who did the same.) Sometimes these will be pitting you against less skill opponents who are given the weight to make things more even, but sometimes the size mismatch it just makes for a more exciting promotion or audience gambling. You can be put up against fighters as skilled or even more skilled you, with a few kilos extra on their side. Long term fighters Farida Okiko and Juliana Rosa both also have notable experience fighting up in weight. This is not universal of course, there are also counter examples of gyms maybe more conscious of public relations that female fighters give them in the west, where weight advantage becomes much more carefully chosen. 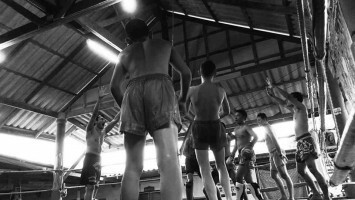 Female fighters, already skilled may arrive and have the initial advantage of size over their Thai opponents and then, upon gaining even more experience, move toward hoped for weight cutting advantages against Thai opponents nearer to their size in high profile fights, seldom venturing out beyond the safety of that zone, avoiding the risk of losses which simply will come if you fight up consistently. 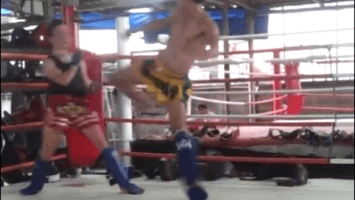 These fighters are often fighting some of the best fighters Thailand has to offer, but they will not be among those long-termers who find themselves facing a pool of skilled, larger fighters as well. Most female fights do not feature weighins. 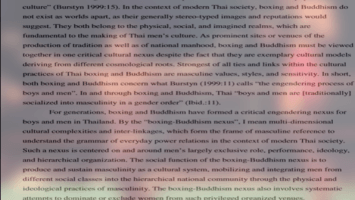 This is true of most fights in Thailand all together, but for women it is more pronounced because we are barred from the large, prestigious stadia where the “professional weigh in” is most prominent, and even barred from televised shows like MAX Muay Thai. For the most part matchups are made by rough estimate from your trainers and promoters. In person, matches may be made with the shoulder-to-shoulder “eye check” of just looking at two potential opponents side-by-side, or if pre-arranged you might not be in the same place at the same time as your opponent at all until you’re in the ring together. 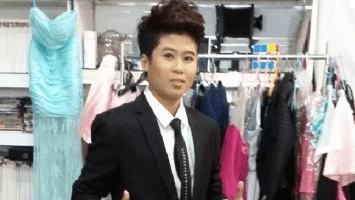 Due to the variety of size and experience among female Thai fighters, along with the overall fewer number of us, most western female fighters will experience both larger and smaller opponents. Because I’m on the smallest end of the scale, I’ve faced very few opponents smaller than myself. Maybe only 3-4 opponents in my 150+ fights here. By the same token, some western women at the higher end of the scale will not have any opportunity to face opposition larger than themselves, or if very skilled, not even necessarily at the same weight – all their fights against Thais may be with the weight advantage on their side. 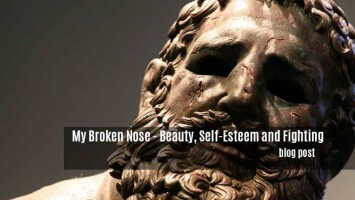 This is just the fact of the situation some fighters find themselves in. You should not judge female western fighters for who they fight; in almost all cases we simply have very little say or control over who we face. 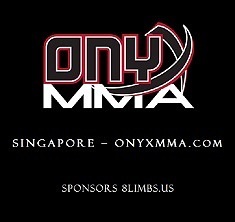 Those decisions are made by our trainers and promoters and all matches come out of the available pool of opponents. If you want to fight, you’ll likely have to fight in a few mismatches and the advantages will be split between the opponents for gambling. In everything I’ve seen between women the general aim is really almost always for a fair and close fight. Size is only one of many possible advantages. 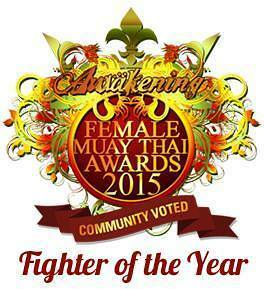 I’d also like to point out as a sidenote: there is a reputation out there that Thai female fighters are not strong. Some of this is because Thai female fighters can take a more defensive, point-fighting approach to winning, lacking the aggression that westerners love, but much of it comes from the fact that Thai female fighters very often take significant weight disadvantages against short term stay, experienced female fighters, and simply do not look strong several kilos down. This goes way back. Take a look at the video of the fights of Master Toddy’s Fight Girls matches, and check out some of the unacknowledged size differences there. 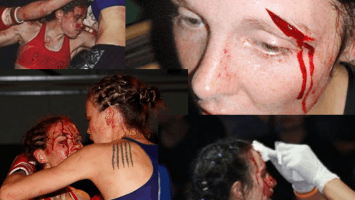 From my own experience I can say that Thai female fighters generally are very strong, and some of them spend their careers taking on a very long series of over-sized western opponents, racking up 100s of fights, simply because there is no one else for these westerners to face. In Chiang Mai old school Nong Mint (now retired) and “The Farang Smasher” Nong Ying are two such absolute warriors, and favorites of mine. 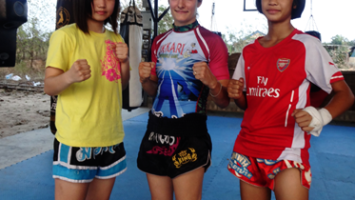 I’m sure many experienced western female fighters on shorter stays came away from Thailand thinking that their Thai opponent was not very good, not seeing the size advantage they were given. Or realizing that many shorter term fights are what I’ve called 80% fights, which is another story. Be that as it may, Western men much more frequently will get the weight advantage in Thailand. They are larger than Thais, generally, but as mentioned it is used to balance out skill levels. 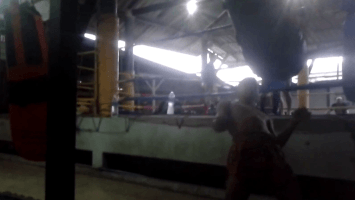 If you are 90 kg, the only ~90 kg Thai opponents are probably out of shape older fighters with ring experience. 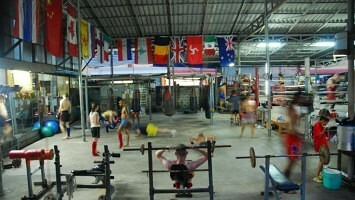 In the same way western women at 60 kg or above won’t have many (or any) high quality Thai opponents at their same weight or larger, depending on where they are and who is available in their pool of opponents, because so many western men are simply bigger than Thais the only option is to fight smaller, more skilled opposition. Often this isn’t the fighter’s “fault,” but I’m pointing out the difference in order to illustrate that it is far more likely for western women to fight up in weight than it is for western men. Over time western women can end up as the size underdog more frequently. And it’s okay – not only should Western women coming to Thailand not be afraid of it, we should embrace it. We should celebrate the women who have the opportunity, and meet the opportunity, to fight up. It is part of the lay of the land. I do believe men can be given credit for fighting up more often than are women, just as women are criticized for having the weight advantage far more than it is even recognized for men. There are countless fights of western men against Thais where fairly large size advantages are simply unacknowledged. You can see these wide weight discrepancies on both minor and major productions. To just use one example, backstage I’ve seen Saenchai shrug off probably a 12-15 lb disadvantage on Yokkao when an opponent couldn’t shed the last few kilos to make weight (the opponent had already cut significant weight to get within that mark, meaning he’d be significantly bigger than Saenchai by fight time the next day) because Saenchai is the “King of Muay Thai” and a westerner having a size advantage against that experience is almost a given; whereas on the exact same fight card I took a several kilo fight-time disadvantage against one of the best female Thai fighters in Thailand, who also had a big experience advantage on me as well. Both of us underdogs, the western man got a big advantage, the western woman a disadvantage. I really didn’t mind at all, I was happy to take that fight and would again, but the size differences simply were not recorded as part of the story of either fight. I’m just saying we need to acknowledge and give recognition to women fighting here in Thailand, not only to give credit, but to make visible the reality and possibilities for women to know what is normal. I champion that women should come here and fight a lot. For many women already doing so this means fighting up in weight too. 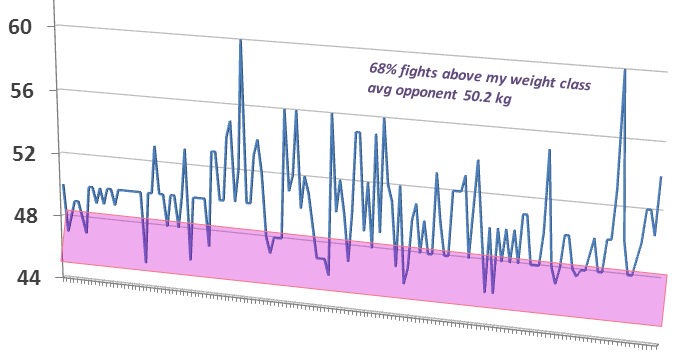 In the chart above the pink represents fights around my weight class. I walk between 47 kg and 48 kg, and fight as low as 45. The lower end fights are roughly against women my size but these involved weight cuts which is rare for me. 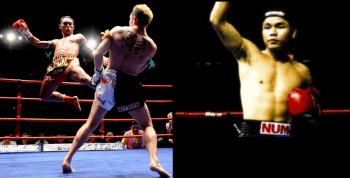 Some of my 48 kg fights were against bigger opponents, as I did not cut weight but my opponent probably did. As you can see though, fighting at 52 kg and over (giving up 4 kilos, or at least 9 lbs at 105 lbs), has not really been uncommon for me. Sometimes even communication can be a problem. In the course of time I’ve been somewhat unsure of how to even express my weight without giving a long winded description when speaking to new trainers or promoters. I assume that saying what I actually weigh on a daily basis makes sense, whereas when the trainers speak to promoters they largely say the weight their fighter could be if there was a weight cut. But it’s not universal across all discussions, so there can be confusion and for sure there is intentional deception from some. As a result, however, I’ve been surprised to learn that promoters who I have fought for for years and even my own trainers from Lanna, where I was for 2.5 years and fighting on average every 10 days (that’s a lot of match-making), still truly do not know my weight. They know I can fight bigger than myself in an obvious way, but they seem to not even realize that all my opponents they have booked are bigger. 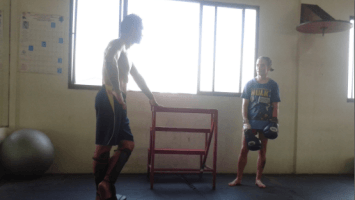 A recent example: the first time I fought Nong Benz, a top fighter in the North who has beaten some big names, we weighed in at 48 kg, which is her “weigh-in” weight and my “weighing in with sweatpants” weight. But who would know that, we both stand on the scale and nobody seems to care how we got to that number. I knocked her out, so the second time we fought, at a different stadium, there’s no morning weigh-in but we have to stand on the scale before getting our gloves on because this stadium takes itself seriously and there’s gambling. I get on the scale in my two shirts and shorts under my sweatpants to weigh just under 48 kg. The promoter looks at the scale twice, then with visible surprise calls out the rounded up 48 and writes it on a piece of paper. The trainer of my opponent is sitting nearby and he looks over with some surprise as well. I ask, just out of curiosity, how much Nong Benz weighed in at and the promoter shows me on the paper it’s 50.5 kg (she’d weighed in in jean shorts and a T-shirt), then launches into an explanation about how this was not a “weight cut” but I’m already giving a big smile and a thumbs-up, like, “sure, that weight difference is fine.” But the surprise from the promoter and the trainer of my opponent, both of whom have watched me fight in Chiang Mai for years, illustrated how completely clueless they were about my actual size. After the fight, when I’d knocked Nong Benz out again, my own cornerman, someone who knows me better than maybe anyone in Chiang Mai, asked Kevin how much I weigh because a gambler was trying to work out a future big side-bet fight for me in his head… my own ex-trainer who books me for fights also doesn’t know what I weigh. This is the point of this story though: gamblers, promoters and my own trainers know I can fight bigger than myself and they should be able to see somewhat visibly when I’m standing in the ring with my opponents which of us is smaller. But they have no idea that they’re even handing me someone bigger a lot of the time, they don’t even really think about it. My case is maybe an extreme because of my small size, and the sheer number of fights I’ve had. 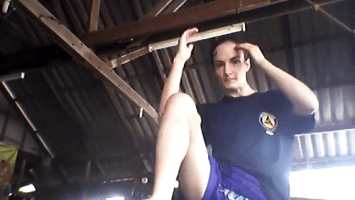 I’m not saying this is something you will step right into as a female fighter in Thailand, but it is a dimension of fighting here, and something that is not talked about a lot. 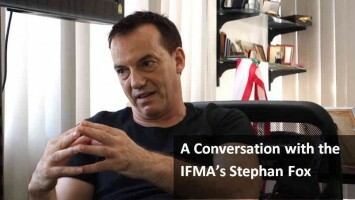 For me, the opponents I fight are larger partly because I’m visually strong (muscles make a big impact on Thais, they think muscles mean lots of kilos), and I’ve also shown that I can handle the difference. It makes for a more exciting match up for promoters and from even the casual viewers I’ve talked to about Muay Thai cards which feature astonishing weight or skill disparities, it appears that Thai audiences really love a visual mismatch; they seem to find it exciting, which is the opposite of how I find it. In higher stakes side-bet fights, this move towards discrepencies is much, much less often the case, due to how much emphasis Thai gamblers put on weight as an advantage/disadvantage and when bigger money is on the line (rather than just entertainment), then these details are far more important. 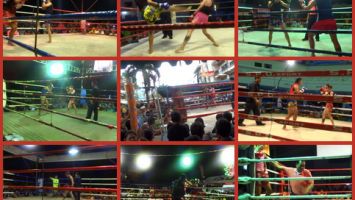 To give an example I fought a pretty big side-bet fight with a few kilo disadvantage up in Isaan against a girl I had already beat, but this time I lost. It wasn’t a big deal before the fight because I had dominated my previous fight with the same promoter, but I presume everyone thought I lost because of the weight difference. The result was: fights against larger opponents dried up up in that region very quickly. My loss wasn’t really because of the weight, but if I had beat her the second time I probably would have then been given another fight with another weight disadvantage, perhaps even more so. Speaking of fight making, what’s somewhat noteable in my own case is that my only trainer who does know what I weigh (Pi Nu) has adjusted how he expresses my weight. When I first started at the gym over two years ago he would only use my weigh-in weight on the phone with promoters, even if there was no weigh in. When I give my weight range to promoters, I usually skip my low end entirely, largely because I never get matched at that weight. If I’m so rarely facing opponents at my actual walk around weight, the chances of a few kilos smaller than that is even lower. Kevin argues with me on this all the time, saying I have to give the lowest possible weight within my range so that promoters understand how small I really am. 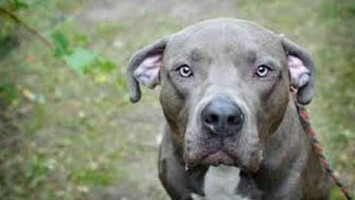 I often try to ignore him, because it seems arbitrary to give a number that will never be matched. Obviously Kevin is right, though, given the story I told above of nobody having any clue of my true size. In the years since I’ve been training at Petchrungruang, however, Pi Nu has stopped giving my low-end weight. His reasoning, he says, is that “nobody at 45-46 kg can fight you.” Like, I have to fight bigger in order for it to be a fair match, and he even includes my walking around weight in that situation. So now he tells promoters to match me at 50 kg. An interesting consequence of the above: because I fight over my weight so much my style has developed to handle bigger opponents. 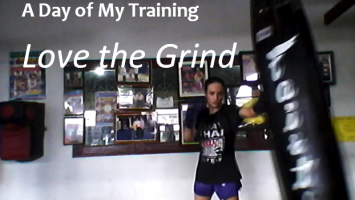 It has changed my Muay Thai. The deflective, evasive fighting styles of opponents near my size are sometimes more difficult for me to handle, because I face them more rarely and don’t even train against my own size in the practice ring most of the time. So, while Pi Nu has changed his view to the extent that he rules out my own size as being incapable of fighting me, I reckon in my own experience it’s developed such that I’m inexperienced with how to fight opponents my own size and those fights can be challenging because of size. What does weight advantage really do? One of the subtle things it can do is just give confidence to you, in a general sense. You feel bigger, you feel less moved, less affected, even if you don’t consciously recognize the disparity. It helps you stand in. It helps you psychologically in clashes. It just will make you feel more stable in space. The other subtle thing that it does is that it can visually impact how the fight is scored, how it is seen. Larger opponents can kind of visually swallow up strikes, make them look ineffectual. 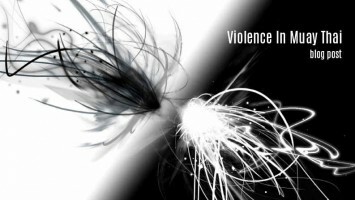 So you have two burdens as the smaller fighter: 1) you have to overcome the natural confidence a larger opponent will feel, and 2) you have to overcome that fact that visually your strikes may not look as powerful as they really are (and a larger opponent’s strikes may not be as strong as they appear). You have to develop your own sense of confidence, and learn how to make your strikes more visible. One thing I learned from training at O. Meekhun with Phetjee Jaa was that, as the smaller fighter, you have to make every strike dramatic – like how stage actors need to sell their movements to the back row whereas a film actor can subtly flare a nostril. I’m still working on this particular aspect of my fighting, trying to make moves bigger and more dramatic. I know my knees are hurting my opponent, I can both hear and feel it in their response to me, but that doesn’t mean the judges or the audience can see it; don’t keep the impact of your strikes a secret between you and your opponent. Jumping on side knees (this shows higher levels of balance), chicken winging knees, or taking more visible drawbacks before straight knees can all make a significant difference in scoring. There are many different fighting styles, this is how I have learned to do it with my own Muay Khao approach. Firstly, matching a smaller fighter with a visibly bigger fighter makes the story of the fight, “is the little guy going to be able to do it?” Gamblers either place a bet on the firm belief that bigger is better, or they’re looking for the David and Goliath upset. So you have to defy expectations; as the smaller fighter, if you can move your opponent or walk through their very heavy strikes, it looks like magic. The belief in you soars. Her advantage in expectation becomes her disadvantage. In fact, when I was with O. Meekhun more than a year ago, a gambling gym, I was chastised for looking “too strong, too early” in the fight. That messed up the gambling because the point is to keep me at the long odds for as long as possible, drive money toward my opponent and then pull out my big guns and win the fight and take your money from the fools who bet on size. I was never comfortable with that, but it lets you know that there is always a narrative being told in a fight, and each fighter is trying to tell the story. Of course, as the smaller fighter if you lose the explanation is always that you were smaller. That’s nice in the sense that you don’t get “blamed” for losing with the weight disadvantage, but it also means that the belief that weight as such a big advantage impacts how these fights are viewed. For example, as the bigger fighter it’s assumed your strikes hurt, even if they don’t. As a smaller fighter, it’s assumed your strikes don’t hurt, even if they do. So you have to make it visually obvious that you’re impacting your opponent as the smaller fighter, or you have to be evasive and tricky. The little mouse evading the big cat is classic; you’ll see a lot of fights like that with the little Muay Femur fighter. But I’m not that. Instead, I’m the Youtube clip where a mouse charges right at the cat and cuts off the chase entirely. Or the movie where the hero climbs into the gears of the giant robot and dismantles it from the inside. Different approaches, different narratives, same size disparity. 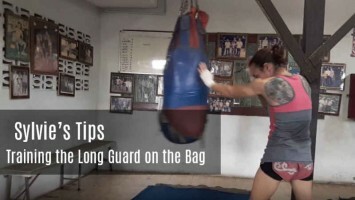 With this in mind another thing you want to do when fighting the bigger fighter is to get in on them, do not stand at pad length (the length at which their pad holder stands and how they practice their strikes). You want to be in that space, inside their optimum distance. This is especially the case if they are tall, but also if they are thick. You want to gum up the gears. With thick, stronger opponents also, as a clinch fighter it is very important to not lose faith if you cannot move them in the early rounds. You have to realize that they do have an advantage, it is for you to just chip away at it. Sometimes when you are used to moving or affecting opponents and you run into someone you can’t move you can start to self doubt. Bring the power down, not up, and keep pressing for advantage, taking stronger clinch frame positions, let them weaken as they go. You may not move them in round 1, but you’ll be moving them in round 4, the scoring round. Sometimes the key to power is remaining relaxed. When I talk about moving a fighter, I mean literally moving them. As a clinch fighter when you lock you need to walk your opponent off their spot, as the smaller fighter. This can come from forward walking when locked, or in a more advanced form, backwards pulling. There are lots and lots of reasons why you should do this (it disrupts timing, forces rebalancing, prevents knees, enables trips and throws), but in the little vs big game it has an important visual effect. A lot of it is just simple perception of causation. When a big billiard ball collides with a smaller billiard ball, you expect the smaller to be moved. When the opposite happens it feels magical. The smaller fighter has some extra power. Moving the bigger fighter will get you points, just from the perspective of an illusion of power. You get more credit than the larger fighter does, so take advantage. This can also be the case with strikes. Because Thailand scoring is much more positional than western scoring, this tactic is more important in Thailand. Relatedly, because bigger fighters “win” most neutralized positions (they look like they have stymied you), you do not want to face a larger Thai opponent who is laying in the ropes for long, as you seek to lock and control them. If they lay back on the ropes they can really look unaffected. You want to lock and pull them off the ropes, or at the very least walk them down the ropes. Make them support their own weight. The approach is basic. Close distance, interrupt strikes as you do so, lock and move, keep scoring with knees. 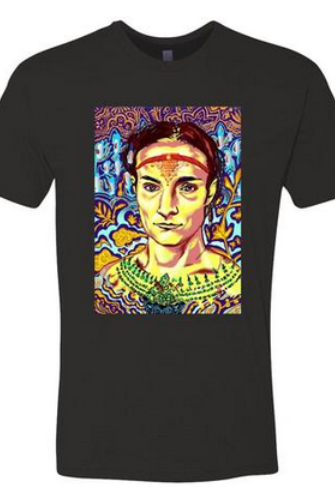 As a Muay Khao fighter you bank on your cardio advantage and in so you demonstrate heart. I’ve dwelt a lot of myself above because this is what I know most. But I hope I also shined some light on other long term female fighters who face weight disadvantages they never would have in the west. 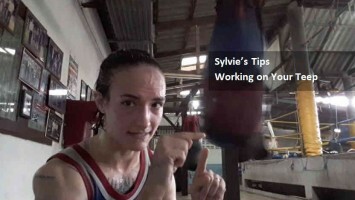 Learning to fight bigger is a important part of Muay Thai in Thailand, I believe, part of the celebration of how technique can control outcomes, and only in Thailand do you really get the chance to do so at a high frequency, especially for smaller or medium bodied female western fighters. Great article, thank you. Do you have any go-to tactics when trying to get inside on a longer fighter who has good distance control or is everything pretty much case-by-case in that respect? Thanks agin for all the content.